These and other stories come together in Walton's Empire of Secrets: British Intelligence, the Cold War, and the Twilight of Empire. Prior to achieving his doctorate in history and Empire of Secrets being an adaptation of his doctoral work, Walton worked as a researcher for esteemed intelligence historian Christopher Andrew. The history traces the history of the British intelligence community from 1945 to 1965, not because this period is bounded or special, but because that is the extent of the Hanslope Park documentation. Everything beyond is still classified. Walton explores a series of colonial Emergencies, which is simply a euphemism for an intelligence failure. These Emergencies include Palestine, Malaya, Nigeria, India, and Egypt. Empire of Secrets functions as a historical corrective to the post-colonial mythology espoused by those who believe Britain's decolonization process was orderly and humane. History has treated the United Kingdom kindly, especially compared to the atrocities and disasters involved in French, Belgian, and Portuguese decolonization. To those new to the field of intelligence history, the United Kingdom's intelligence organizations will seem very different from the activities of familiar organizations like the Central Intelligence Agency and the National Security Agency. Unlike the CIA, British Intelligence did not have an operational branch. Operations were usually performed by Scotland Yard Special Branch units, the Special Operations Executive, and the SAS. British Intelligence (meaning MI5 and MI6) acted in a purely advisory capacity. The result was the ironically calming recommendations to Her Majesty's Government. Walton illustrates this with examples from British Intelligence monitoring suspected Communists like Jomo Kenyatta and Kwame Nkrumah. While both flirted with Communist ideology, British Intelligence assessed that both held stronger beliefs in nationalism. During the inevitable hand-off, British Intelligence officials made sure to cover up their surveillance activities by destroying or fabricating files on the leaders. In many cases, political pragmatism trumps ideological purity. Despite being the subject of surveillance, the newly minted leaders wished that British Intelligence would remain to advise them on security matters. Although the pragmatism has its dark side, since most leaders used the former British intelligence apparatus to create an oppressive regime and give them an unfair advantage over their political opponents. The carnage of Nigeria is contrasted against the comic idiocy of the Suez Crisis, a colonial Emergency so heroically mismanaged Mr. Walton compares it to the modern intelligence failure of President George W. Bush's Iraqi misadventures. His coverage of the British Mandate in Palestine offers a succinct explanation of a complex and volatile era of Israeli history. He retells the violent birth of Israel with nuance and understanding. 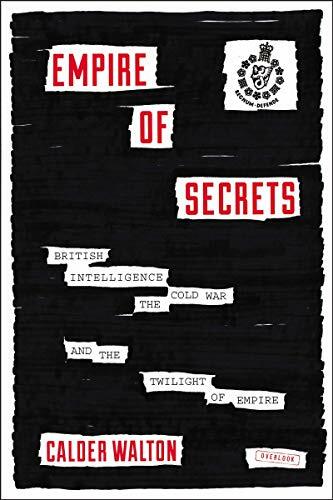 While Empire of Secrets is written in a highly academic tone, for those interested in the Cold War, intelligence history, and British decolonization, the book proves indispensible. It tells the story of Britain—empire on the wane, under the shadow of the United States—working desperately to keep its colonies, both as a matter of national pride and as an anticommunist crusade. But, as they say in weight loss commercials, results may vary.